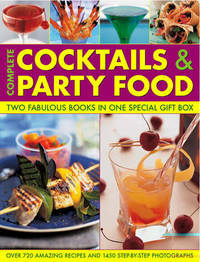 This work contains two fabulous volumes in one gift box covering everything you need to throw a fantastic party. It offers instructions for making hundreds of cocktails and drinks, including all-time favourites such as the Frozen Strawberry Daquiri, Tom Collins and Cosmopolitan, and more unusual drinks such as the Pink Pussycat, Hammer Horror and Eye of the Tiger. Features include: a complete guide to the different types of drinks and mixers available, including both alcoholic and non-alcoholic drinks; a basic techniques section explains how to measure, mix and pour drinks, with step-by-step photographs showing how to frost a glass, use a cocktail shaker and make decorative fruit twists; successful party planning with the minimum of fuss - plus advice on making guest lists, seating plans, table settings, decorations and themed parties; useful information on menus, equipment, food preparation, cooking ahead and essential party food, wine and drinks; appetizing party favourites include simple nibbles, finger food, dips and dippers, and recipes for informal brunches, lunches and suppers; stunning buffet centrepieces, ideas for picnics and barbecues, and dishes for formal entertaining.